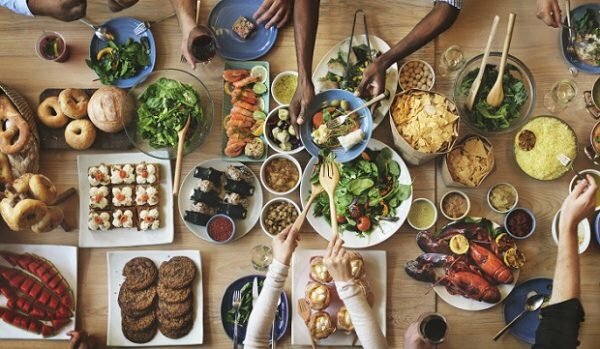 Since we can’t all be Martha Stewart, hosting a dinner party can take some planning and making sure you have everything you need to host a killer get together is key. Here are six ways to plan. a menu, shop for what your need and create your tablescape. Tablescapes create the canvas for your evening. The settings are the base for your dishes and meal and help set the overall tone. Start with buying fresh blooms from your local florist or flower shop. These can be bought the morning of and kept in fresh water until situated. Accent your entryway, living room, kitchen and table with smaller bouquets to keep the fresh scent throughout the house. Smaller tea light candles can also set the mood of your table. Choose non-scented candles to add a little bit of warmth and light to the room. If possible, set your dining table early in the day so you can concentrate on food prepping. Keep it simple with light linens, neutral plates that can be topped with smaller decorative appetizer plates and a simple napkin. Decorate each setting with an intricate napkin ring or add pops of color with wine glasses in your favorite shades. When figuring out what to serve, we recommend planning your menu a week in advance. Make sure to check with guests if there are any allergies in the group to avoid cooking with those ingredients. Always have at least one or two dishes that everyone is able to eat. Make sure to stick to what you know. Now isn’t the time to experiment with that new dish you’ve wanted to try and make for a while now. We suggest building your menu based around a common theme. Keep the cuisine within the same family. If you are cooking a delicious Italian dish, we suggest keeping appetizers and smaller dishes Italian-themed too. Once you’ve decided what you will be serving, make sure to write down everything you will need. Go through each course and make a checklist of ingredients. Plan ahead and call your local butcher, fish shop or bakery beforehand to see how much time in advance you have to place an order for your number of guests. We suggest serving a starter dish such as a salad or soup, your main course accompanied by a vegetable, a starch and lastly dessert. Make sure to wear an apron! Pick up any meat, fish and any other items you may need. Marinate any meat that may need a few hours of seasoning. In addition, prepare whatever you can that will taste just as good the next day and chop any veggies the day before as well since that can be pretty time consuming. This will leave you with more time to relax and regroup the day of your party. If you need to soak anything overnight like beans or rice, now’s the time. You can also start prepping a bar station if you are setting one up and prep any serving trays and cooking utensils you’ll need for the following day. Music will help set the mood of your dinner party. Playing tunes in the background helps with eliminating any awkward silence and keeps guests alert and aware. Make sure to keep the music playing low, but loud enough for guests to enjoy. If you are hosting a holiday dinner, theme your playlist around holiday tunes. We suggest using Spotify, Pandora of iHeart Radio and choosing light tunes to kick off the night. Tune into some oldies but goodies and for more formal dinners a little light jazz or classical music will help keep the flow and feel of the evening lighthearted and enjoyable. You’re the host and need to enjoy all the work you’ve put into your tablescape and prepping a delicious meal. Once all of your guests have showed up, make sure to take part in the mingling and eating and enjoy your company. Pour yourself a cocktail or glass of wine and enjoy yourself as you prep and serve your guests. Dishes can be cleared slowly, remember, your gathering with friends to enjoy each other’s company and conversations. And if friends offer to help clear dishes, take them up on it. Accepting help from other’s can make the evening more relaxed and have friends feel they lend a helping hand. Subject: LongIsland.com - Your Name sent you Article details of "Six Tips on How to Host the Perfect Dinner Party"